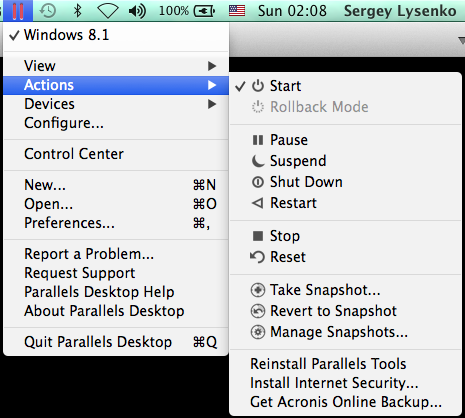 With Parallels Desktop 10 for Mac several changes in the User Interface were introduced. 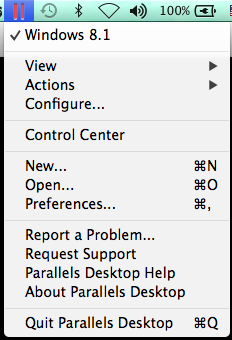 In Parallels Desktop 9 and earlier versions this menu would appear only when your virtual machine worked in Coherence view mode and served for the virtual machine only. 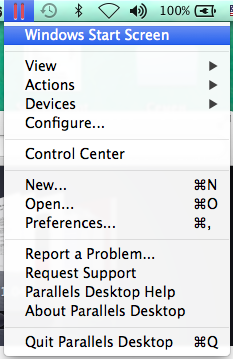 Now this is a global menu, it appears in the Mac status bar once you start Parallels Desktop and serves for both Parallels Desktop itself and for your virtual machines. 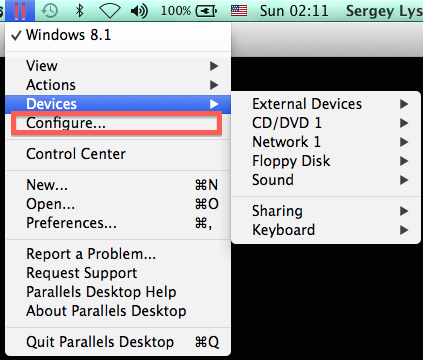 This menu is available all the time Parallels Desktop is running, so you do not need to click on the Parallels Desktop Dock icon every time you need to access its Preferences or create a new virtual machine. Parallels Desktop menu may look slightly different depending on whether Parallels Desktop is in focus or not, whether your virtual machine is running or in focus. As you can see all necessary menu items are here: you can activate the Parallels Desktop Control Center, Create a new virtual machine, Open and existing one, open Preferences, generate a problem Report or even Request Support. 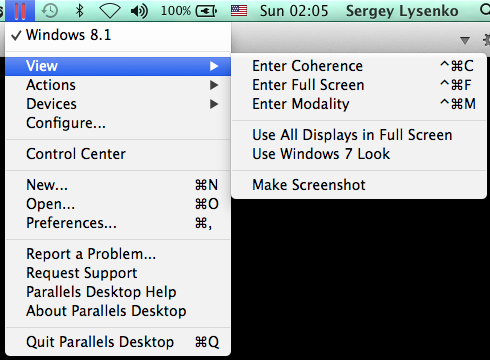 Now this menu combines the items related to Parallels Desktop itself with the items related to your virtual machine. 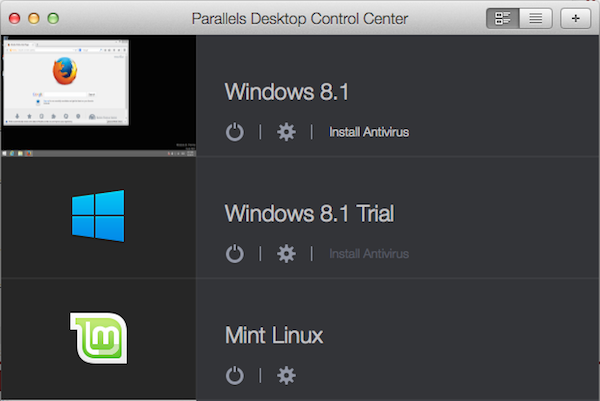 Parallels Desktop Control Center replaced and combined the Virtual Machine List and the Security Center. 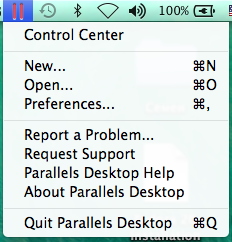 You can activate the Parallels Desktop Control Center from the Parallels Desktop menu in the status bar (see above) or by clicking the Parallels Desktop icon in the Dock. Virtual machine icon now appears in the Dock every time you launch your virtual machine. You can easily switch to your Virtual machine by clicking on its icon in the Dock. This feature is extremely useful when you run two or more virtual machines at a time or if you prefer running your virtual machine on a separate Desktop (Space). You can also pin your virtual machine icon to the Dock or even add to the Mac Launchpad and launch your virtual machine directly from them.